Sadly this week former Israeli President and Prime Minister Shimon Peres passed away. Many parts of his life are recorded in the All Israel Database on this site. We thought it would be useful to give an overview of his life and point to some of the records available here, both to honor his memory and to illustrate the breadth of the records (over 810,000 records from 279 databases, and growing every month) available in our database. Note that you must be logged into this site to see the full records, and you must be a member of IGRA to view the images when they are present. To get a sense of the breadth of our database collection, you can read the database description by period – Ottoman, British, Israeli, and Miscellaneous (non-Israeli databases). Following the records of his life is akin to following the history of the State of Israel. Born Szymon Perski in Wiszniew, Poland (now Vishnyeva, Belarus) in 1923, he moved to British Mandate Palestine in 1934 with his family. In his youth he became involved in the Mapai party (an acronym for Mifleget Poalei Eretz Yisrael, or the Worker’s Party of the Land of Israel), which was the party of David Ben-Gurion and the predecessor party to the current Labor Party. In 1942 he would vote for the Knesset Yisrael (Hebrew: כנסת ישראל‎) which was one of three representative groups of the Jewish community under the British Mandate. 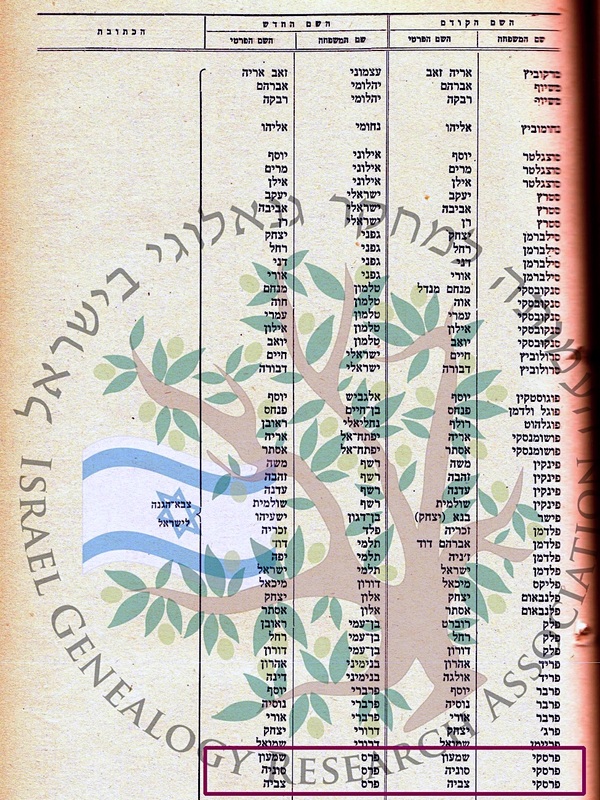 He is listed there are Shimon Perski, son of Yitzhak, from Geva. This was added to our database in 2014. He would rise through the ranks of its youth leadership, joining Moshe Dayan as the two youth delegates of Mapai sent to the 1946 Zionist Congress in Basel, Switzerland in 1946. In 1947, he joined the Haganah, the precursor to the Israel Defense Forces, and after independence in 1948, he would lead their naval services. In 1948 he would, as many inside and outside of government during those years, change his name to a Hebraicized name – Shimon Peres. This name change, along with those of his wife and daughter, are recorded in our database of name changes published by the Israeli government in the Eton Rashmi (the official publication of the federal government of Israel), and added to our database in 2014. This is a good example of a database we are working on that requires a tremendous amount of effort by a large number of volunteers to complete. We’ve scanned and indexed only about 4 years out of more than thirty years worth of published lists. If you’re interested in volunteering to help with this among other projects, please contact us. In 1949 he ran for the General Council of the Histadrut, Israel’s umbrella trade union. 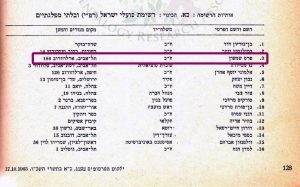 You can see his name listed among the candidates from a list published in the Hebrew newspaper Davar, and which we indexed and added to our database in 2012. In 1953 he became Director of the Ministry of Defense, the youngest person to hold that job at only 29. In this position he established a close relationship with France, who provided many of Israels fighter planes and built its nuclear reactor (built in 1956). In 1959 he would run for Knesset for the first time, as a member of the Mapai party. 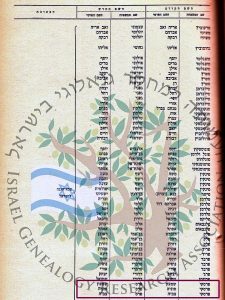 The list of candidates for the 4th Knesset, where his name is found, shows his address, occupation, political party, and language spoken. This list was added to our database in 2015. He would go on to be elected in almost all future Knessets, and the interesting political changes in the country can be traced through the parties he is affiliated with in each Knesset. In the 5th Knesset election in 1961 he ran again with the Mapai party. In 1965 he would run for the 6th Knesset in a party called Rashimat Poalai Yisrael (Rafi) which broke away from Mapai and was led by none other than David Ben-Gurion. In 1969 he would run for the 7th Knesset under the new Alignment Party (formed by the merger of the Mapai, Rafi and Ahdut HaAvoda parties). Peres would continue to run in future elections under the Alignment party banner for many years, including the 8th Knesset in 1973, the 9th Knesset in 1977 (where he start his run as leader of the party), the 10th Knesset in 1981, the 11th Knesset in 1984 and the 12th Knesset in 1988. In 1991 the Alignment would cease to exist, and in the 13th Knesset in 1992 and the 14th Knesset in 1996, Peres would run under the Labor Party. In 1999, he would run in the election for the 15th Knesset in the newly formed (and short-lived) One Israel party, which was a merger of the Labor, Gesher and Meimad parties. In 2003, with One Israel dissolved, he would run for the 16th Knesset as part of the Labor Party. In 2005 while leader of the Labor Party Peres provided the votes needed by the ruling Likud party to carry out the disengagement from Gaza. This angered many people from both parties, and Peres lost a leadership race for his party, and Prime Minister Ariel Sharon was largely expected to have a fight maintaining control of Likud. Instead of having that leadership race, Sharon left the Likud and formed a new party for the 2006 election, named Kadima. Before the elections took place, however, Sharon had a debilitating stroke. His deputy Ehud Olmert would lead the new party into the election with Peres joining the new party as number two on the party list for the election to the 17th Knesset, which they would win. 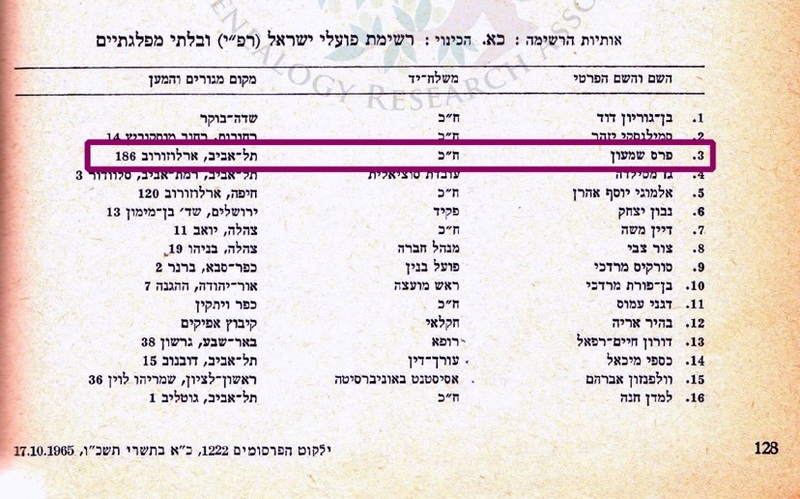 There are other records referencing Shimon Peres in our database. Take a look and see what you can find! Shimon Peres served in many senior roles in the government over the years. He was Foreign Minister in three different governments, Defense Minister in two governments, and Minister of Finance and Minister of Transportation each in one government. He served as Prime Minister three times during his life. He served briefly as Acting Prime Minister in 1977 when Yitzhak Rabin was forced to resign over a scandal. He would serve again from 1984 to 1986 while part of a unity government with the Likud party. 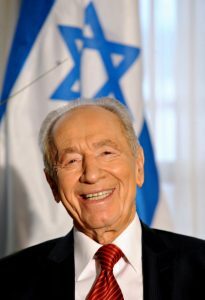 He would again serve as Prime Minister as a replacement for Yitzhak Rabin after Rabin was assassinated in 1995, and served through the 1996 election. In 2007 Shimon Peres would end his more than 50 years in the Knesset and become the 9th President of Israel. He served as President until 2014. Shimon Peres died on September 28, 2016. His funeral, taking place tomorrow as this is being written, will be attended by over 80 world leaders, including US President Barack Obama, former US President Bill Clinton, UK Prince Charles, German Chancellor Angela Merkel, French President Francois Hollande, Canadian Prime Minister Justin Trudeau, Australian Prime Minister Malcolm Turnbull, and Mexican President Enrique Peña Nieto. We hope you’ve found this history and the documents from our database interesting. If you are interested in helping expand our collection of databases, please contact us. We are also always looking for volunteers to help with other aspects of the organization, such as web site building, graphic design, and lecturers on many topics related to genealogy.